My kids love to get outdoors and play. 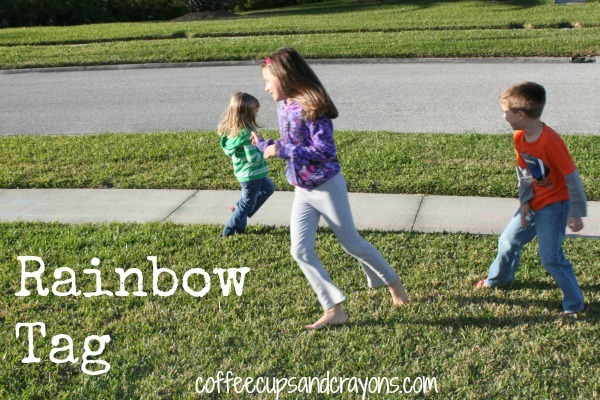 Since my 3 year old has been rainbow obsessed this week and we decided to add some rainbow-ness into some of our traditional outdoor games and came up with three fun ways to play. My older kids are so happy that my 3 year old can finally really play Mother May I? with them! We had painted a bunch of rainbow plates and used one of them to make a rainbow hat for Rainbow May I?!!! I drew two rainbow lines on our sidewalk with sidewalk chalk. One of the kids stood put the rainbow hat on and stood at the purple end. The other two each started at the beginning of the rainbow lines and took turns asking Rainbow May I? They did the traditional, May I take 3 leaps, 4 twirls, etc. and added in some color fun with requests like, May I run to yellow? We added in some learning by naming the color that they landed on, talking about what sound the color started with, and predicting which color they would land on. After playing Rainbow May I? for awhile they decided they wanted to race! They raced from one end of the rainbow line to the other and back again. And again. And again. I joined in after this picture and we had a blast thinking of different ways we could race across the rainbow. 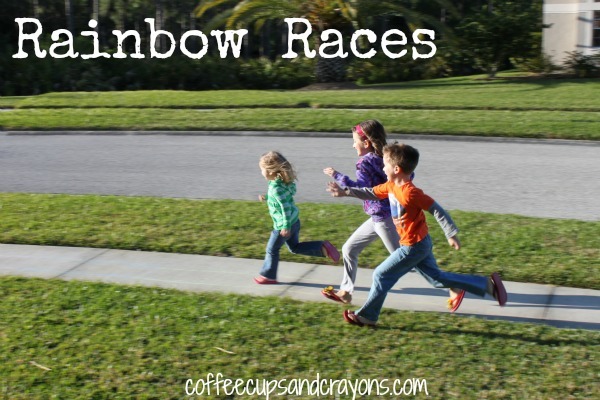 Let’s just say they can definitely beat me at race across the rainbow like a puppy! We started off playing that whomever had the rainbow hat on was it, but the hat did not make it very long! One of the kids was the rainbow and tried to tag the others and turn them into rainbows too. After you were tagged you joined in with the other rainbows to help get the others. Once almost everyone was a rainbow the last person became the leprechaun. We added in challenges for the leprechauns such as, you had to touch something red before you could tag anyone. 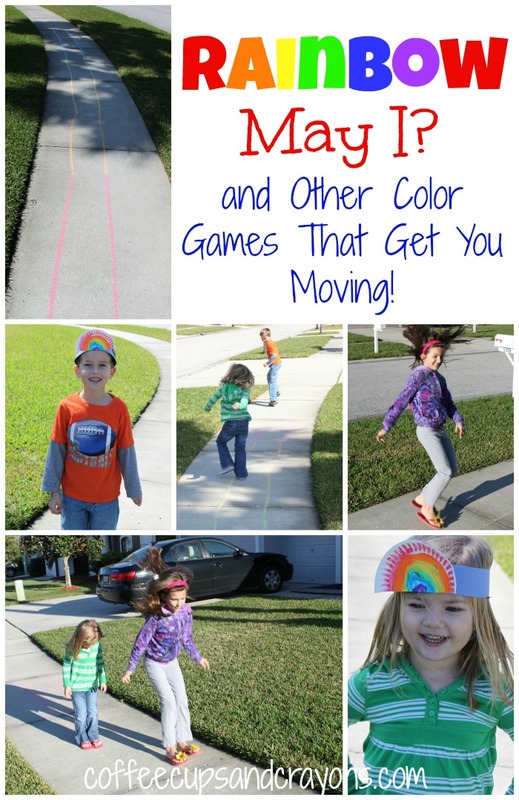 It was silly and fun and a great way to get moving outside! We made a rainbow banner by painting circles like Happy Hooligans did except we used small paper plates we had leftover and then just cut them in half once they were dry to make our banner! We ate Rainbow Jell-O in a Jar! We went on a Rainbow Toy Hunt and then my almost 5 year old practiced matching the toys to the correct color word card. How have you had fun with colors and rainbows lately? Oh, you and your sunny Florida weather. I love these ideas! Perfect for spring playtime. I’m sharing this on my fb page along with my picture book of the day, “A Rainbow of my Own.” Thanks! We love that book! We actually read it last week too! Thanks for sharing! Awesome! I loved the family photo on your blog–gorgeous!